We’re in the midst of a stormy weekend out in the garden. It has been raining all day with the occasional downpour and one or two mad hail showers, with little white hailstones bouncing about everywhere. Tonight there is wind, great gusts of it. There are times when the wind is so strong that the whole house shudders, but it is not so bad out tonight. There is just the continuous patter of the rain on the roof and the odd lightning bolt. This is not great weather for garden work, but it is wonderful weather for being curled up in bed as I am now, listening to the rhythmic breathing of my sleeping family. And what does any of this have to do with the photo of bread? 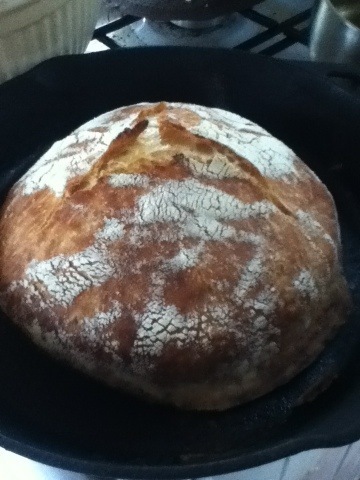 A while back, I tried a no-knead bread recipe from the New York Times. Yes, that one. It always came out okay, but my dough was sort of flabby and lifeless after the first rise, so I didn’t consider my efforts a great success. For Christmas this year, my mother gave me Jim Lahey’s book, My Bread. I love reading books about baking bread, so I eagerly dove in, despite my past failures. Well, the crucial difference is that in the book the measurements are given in weights as well as by volume. I guess I’m sloppy with a measuring cup, because when I used the weights (by far my preferred way to measure when I cook anyway, particularly for bread and jam) it turned out beautifully. My first truly successful loaf came out of the oven minutes before we left for the garden. We wrapped the loaf in a towel and loaded up the car. Getting out of the house is a lengthy process, and there is always at least one thing left behind. This time it was Baki’s headphones. I had the bread in my hands and had set it on the top of the truck when the wail came from inside. So off I went to fetch the headphones. Once I had them, we were off. Except that I had forgotten the bread on top of the truck. “Stop the car!” I said, and ran to the back of the truck. It’s a pickup, so I thought maybe the bread had just dropped into the back. Naturally, it had not. We doubled back. No bread. This bread is literally effortless to make, so when we got home I started another one and the happy result is pictured above. We sat on our hands until it cooled and then ate the lion’s share of it, with generous portions of quince jam, sitting on the terrace drinking tea and watching the rain. Hail to the postman! You do have it right, although it’s all a bit of a muddle. Baki goes to school in town, so we are only in the garden on weekends. My husband holds down the fort while we’re away. Siobhan, The bread looks gorgeous. Wish we were there to share it with everyone. Can you make one when you come to NYC? I’m pretty sure my mom will make you a loaf the minute she gets back to NYC!